This book has been a lot of work for me but, finally, it is done. "The Limits to Growth Revisited" has been published by Springer in June of this year. Writing this book has been a fascinating work. Re-examining the story of LTG opens up a whole new world that urban legends and propaganda had tried to bury under a layer of lies and misinterpretations. We all have heard of the "mistakes" that the authors of LTG, or their sponsors, the Club of Rome, are said to have made. But LTG was not "wrong": nowhere in the 1972 book will you find the mistakes that are commonly attributed to it. LTG never predicted catastrophes to occur soon, never estimated that some specific mineral resources should run out by some specific date, it never contained prophecies of doom. In other words, LTG is not, and never was, "Chicken Little with a computer." What caused the demonization of the study was, in large part, the fact that it was so new and so advanced for its times that it was widely misunderstood, often by its supporters as well as by its detractors. But the misunderstanding was enhanced by a media campaign very similar to the one that has been recently directed against climate science. The trick of these campaigns is always the same: find a single mistake and use it to demonize the whole concept. It doesn't matter that the mistake is real or an invention, it doesn't count whether it is relevant or not. It is enough to repeat the concept of "mistakes" a large number of times to confuse the public and cloud the issue. In recent times, the method has been used to demonize climate science with the alleged mistake found in the "hockey stick" temperature reconstruction of past climate. For LTG, the "mistake" was found in a few numbers taken from just one of the many tables of the 1972 book. There was nothing wrong in these numbers, but the concept of the "mistakes of the Club of Rome" went viral and it is still widespread, and perhaps prevalent, whenever the LTG study is mentioned today. All together, these factors push the world system to follow a well defined path. We cannot determine exactly what the future will be, but we can produce a "fan" of trajectories that show to us where the system is heading to. The original 1972 LTG study had already identified the main factors that have been dominating the behavior of the world's economy. The combined effects of resource depletion and pollution accumulation (seen today mainly in terms of climate change) have been gradually reducing the ability of the industrial system of accumulating capital and of fuelling growth. These factors will, eventually, cause the world's industrial and agricultural systems to start a decline that could be defined as "collapse" which, later on, will involve also the collapse of the world's population. It is not possible to determine exact dates for these events but, still, the insight that this kind of modelling offers to us is amazing. Just think how the LTG scenarios of 40 years ago can be interpreted as indicating that the worldwide financial crisis that occurred in 2008 may be the first hint of the impending collapse of the world's economy. Note also how these scenarios also anticipate the present debate on whether climate change or "peak resources" is the most important problem that we face. Dynamic modelling is a flexible tool, something that enhances the capability of the human mind to understand the world that surrounds us. The 1972 LTG study was the first to use this tool, but it is not the only possible way. Simpler dynamic models will tend to produce the same final outcome. I have to thank a lot of people for their help and support with this book, but the whole list would be too long here - you can find it in the book. Let me just mention the main ones: Charles Hall, who made this book possible, and Dennis Meadows and Jorgen Randers, two of the authors of the first 1972 LTG study whose contribution was essential for my work. I would also like to mention the help of Jay Forrester, the father of system dynamics, well in his 90s when this book was written but who, nevertheless, provided me with precious insight and information on the story of dynamic modelling. The book is dedicated to the memory of Matt Simmons, who was among the first to re-evaluate the LTG study after it had been demonized in the 1990s. You can read the introduction to "The Limits to Growth Revisited" on Google Books. Here is the description of the book that you can find on Springer's page. “The Limits to Growth” (1972) generated unprecedented controversy with its predictions of the eventual collapse of the world's economies. First hailed as a great advance in science, “The Limits to Growth” was subsequently rejected and demonized. However, with many national economies now at risk and global peak oil apparently a reality, the methods, scenarios, and predictions of “The Limits to Growth” are in great need of reappraisal. 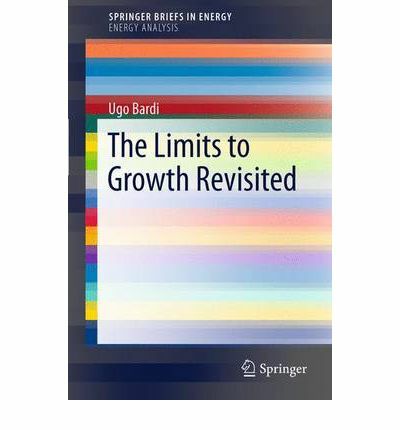 In The Limits to Growth Revisited, Ugo Bardi examines both the science and the polemics surrounding this work, and in particular the reactions of economists that marginalized its methods and conclusions for more than 30 years. “The Limits to Growth” was a milestone in attempts to model the future of our society, and it is vital today for both scientists and policy makers to understand its scientific basis, current relevance, and the social and political mechanisms that led to its rejection. Bardi also addresses the all-important question of whether the methods and approaches of “The Limits to Growth” can contribute to an understanding of what happened to the global economy in the Great Recession and where we are headed from there. Great work Ugo. Supposedly this is one of the most read scientific books ever, with 10 million sold. And yet most people who comment on it seem to have never read it, many even in the peak oil scene. I found it to be very carefully worded; gently alerting people to what the authors were careful to say where projections, not predictions. Since the projected resource peaks and major pollution problems tended to be in the 21st C, it was a great work of misrepresentation that the authors were seen to have been alarmists that got it wrong. Since you are one of the best authors on these issues, I'm sure you've done a great job with the book, and I hope you get lots of exposure to help clear the book's name. Another "support the police state" book comes out.... defending and upholding first book,. 1972 Limits to Growth. From synopsis.... "Just think how, already 40 years ago, the LTG study may have anticipated the worldwide financial crisis that occurred in 2008 " Interesting, so author never heard about the Federal Reserve? Author has no clue that financial bubble was not outcome but was orchestrated? Maybe author should watch Matt Damon documentary 'Inside job'. Millions of others know that 2008 crisis was fabricated, but author completely denies the facts and rewrites history. Author apparently never researched the Club of Rome. That will be completely missing in this book. "In the book “The First Global Revolution“ (1991) the Club of Rome openly admitted, that the whole green ideology is just an artificial hoax serving as a tool to grab power. This was a 1991 admission about 1972 agenda. In it you see how masses are demonized as a problem. Humanity isn't the problem, greed is the problem, and the masses aren't greedy, they are starving. So who then is the problem. Here there is silence. In 1972 the environmental movement had already started. Earth Day had already happened. Limits to Growth in 1972 co-opted that movement. Since then, NWO has bought out all environmental groups so that by the time of Gulf Oil 'spill' Operation, Sierra Club was SILENT about dealy covertly deployed oil dispersant Corexit. Silent! "In his Memoirs,[page 405] Rockefeller admits, that the goal of all this is to unite the whole planet under a single government: “Some even believe we are part of a secret cabal working against the best interests of the United States, characterizing my family and me as "internationalists" and of conspiring with others around the world to build a more integrated global political and economic structure - one world, if you will. If that's the charge, I stand guilty, and I am proud of it."" He is proud of being secretive, because elitists think it their right to manage the masses and not inform masses. I wonder if author knows about fake pandemics and vaccine eugenics and radiation and fluoride and other depopulation programs? Millions of other know, but author doesn't? I promise you this new book is NWO propaganda. TOP/DOWN management is always the bottom line. Incredibly, many progressives will read this book and not know Rockefeller and cronies were behind the whole agenda. "If you care for the planet support NWO!!!" Watch how quickly this book will be translated into many languages. Is this an individuals effort? No, it is funded, and will be promoted extensively. So the outrageously wrongheaded, nay hysterical, opposition continues even now we're in the 21st century! Astonishing how some climg to old certainties. Of course the web has exacerbated the denial as every lamebrain can copy and paste ad nauseam these days in an attempt to show they know what they're talking about, but this particular screed appears to be the work of either a non-native English speaker or an illiterate; probably American then. And still banging on about the imaginary conspiracy to reduce the human population, as if! I'm impressed you are amused by it Ugo, I tend to despair these days as the strident misinformation specialists continue to seal all our fates and politicians repeatedly show they are inadequate to the task at hand. 'from an investigative website' don't you just love it! Translated as 'from a troll website packed with misinformation' and they always seem so impressed with themselves! I worked on the autobiography of one of the founders of the Club of Rome, Alexander King, and although he deals extensively to how it all came about - he and Peccei meeting almost by chance, they discussing issues they shared an interest in etc. Nowhere was there any mention of a desire to construct 'an artificial hoax serving as a tool to grab power', in fact neither man appeared to be interested in power, and King saw himself as first a scientist and second a public servant, serving humanity. How these things get distorted, he would be saddened to see himself villified in the manner he is. A decent, honourable man. And then along come the rewriters of history, neither decent nor honourable. Absolutely great, Ray! I did expect something like that, but you surpassed my wildest expectations! You managed to throw in even chemtrails, vaccine eugenics and fluoride. I mean, not an easy task, but you succeeded beautifully. Thanks! I translated and reposted this article on my own blog. It's very important to give the original LTG-models a second chance, now we are experiencing the first contact with those limits. I'm looking forward to reading LTG Revisited. Thanks for all your work Ugo and everyone else involved. As for Mr. Songtree, I think people like him are actually on some corporation's payroll. I mean honestly! How absurd is this. Only someone with an agenda or someone with mental illness would believe that stuff with absolutely no evidence to back up anything he says. It is people like him and his employers that do make me think that humanity could head into a new dark age as the global industrial economy breaks down. It is evident to me, that the multi-nationals are doing everything in their power to confuse, misinform and "dumb-down" people. Well I guess we'll just have to wait and see how it all turns out! Yes, people like Mr. Songtree are so funny that you always wonder whether they are actually nuts or if they are on the payroll of someone. It is always difficult to say; there is evidence of paid trolls infesting the web, but there are also cases of complete disconnection with reality. Normally, they are harmless but in large numbers they are perfectly able to have an effect in swaying the public perception of important issues such as global warming. Indeed. One such paid lobbyist is Nigel Lawson, an economist, ex UK MP, ex government chancellor and now paid by the oil industry, in which he keeps substantial wealth invested. He runs a website from which the trolls like 'Songtree' get their lies to copy. They become more desperate as the evidence piles up. At the risk of feeding the troll, I would advise Mr Ray Songtree that asset / credit bubbles typically grow only in the fertile soil of a real growth story. The story of the fossil-fuel powered unsustainable overshoot of the 19th and 20th centuries led to real progress, increased standards of living and massive capital formation. On the back of this real story, and powered by excessive debt, all sorts of dreams were sold and bought, giving rise to monstrous asset bubbles. The story of the 21st and 22nd centuries already is, and will continue to be, one of declines in easily available net energy for use by society, which has certainly been the case since at least 2005. As this is the opposite of the story that led to the monstrous asset bubbles in the first place, we should not be surprised to find that the bubbles "happened" to burst shortly after the soil in which they were growing was depleted of its most basic nutrient: and that is none other than the Real Story on which exaggerted dreams were built upon. In the comments here, beware the spambots: "Plumbing" and "pextubing" are bot machine posts. They do this to get their links into Google searches; caution -- don't click the links -- without making sure your anti-malware software is up to date. But if you right-click and copy the links they hide behind the "names" used then search for the sites you'll see how many times these bots have gotten into Google's list. I am looking forward to reading your book very much. I just picked up a copy of the 2004 rev of LTG, and will be reading that first, then yours as a companion piece. I also should say that I enjoy your work immensely, having discovered it thanks to JM Greer's pointer to your piece on Stoicism and peak oil, which I thought both delightful and incisive! Brookings Papers on Economic Activity, Vol 1992, No. 2 (1992), pp 1-59. "I showed above that the "lethal" nature of economic growth in Limits I and II can be reproduced in simple growth models. I will now show how the entire argument can be reversed with a simple change in the specification of the model; more precisely, I will introduce technological change into the production structure and assume that the Cobb-Douglas production function accurately represents the technological possibilities for substitution." His calculations and conclusions following this *seem* to be serious and credible, but I am not enough of an economist to be able to assess their validity. I wonder if you do so in your book? no attempt was made to estimate the behavioral equations econometrically, although some attempt seems to have been made to calibrate some of the equations, such as the population equation, to available data. to the "essential" nature of different inputs. There is no substitution between abundant inputs and limited factors, such as the severely limited natural resource of land. No pollution abatement was allowed in Limits I, although it is possible in Limits II to reallocate capital to pollution abatement activities. history during the capitalist era. Again, not having studied LTG yet, nor being an economist, it's hard for me to assess the validity of his charges. I wonder if you have studied these arguments, or Nordhaus' paper, and could comment, or if this is covered in your book? BTW, Nordhaus does mention that the second edition of LTG (Limits II, in his terminology) did not correct the issues he cites above, and I'm wondering if any of these were addressed in the 2004 edition. If you do happen to read this, and choose to respond, then thanks very for your your time and attention! "Yes, people like Mr. Songtree are so funny that you always wonder whether they are actually nuts or if they are on the payroll of someone. It is always difficult to say; there is evidence of paid trolls infesting the web, but there are also cases of complete disconnection with reality." I suspect this has more to do with the projection of the Jungian shadow onto the world stage than with any form of payment for spreading absurdities. Additionally, in a world as complex (and disconnected) as the one we humans have come to inhabit, levels of personal anxiety increase tremendously, and can be more readily managed by blaming all the world's ills upon one secret cabal that's pulling all the strings - so again, an unconscious motivation. Well, we're heading back towards hunter-gatherers fast. At least their lifestyle was sustainable! Hanks, thanks for alerting me about the spambots. Normally they should be automatically deleted, but for some reasons they weren't. So, I removed the comments manually. William Nordhaus started his career in the early 1970s by criticizing LTG and the parallel work made by Jay Forrester. He never really understood what LTG is about, but he had intelligence, clout and a way of writing that gave the impression that he knew what he was saying. His 1992 paper really gives the impression of having a logic, but if you read it carefully you'll see its many, many mistakes and weak points. It is a mix of misunderstanding, propaganda, wishful thinking and little more. The problem is that it is not so easy to see that if you are not really familiar with the LTG work. Anyway, You can see that there is something deeply wrong with Nordhaus' paper just by looking at the "discussion" at the end. Which is not a discussion, it is more of a feeding frenzy of academics who behave like sharks in a National Geographic documentary film. Ah.... OoR, incidentally, the quote you post from Nordhaus' 1992 message is a cryptic reference to his 1973 paper where he had strongly criticized Jay Forrester. That was one of those papers that should haunt one's reputation for a full lifetime; so incredibly wrong it was. It was wrong from top to bottom, truly shameful. But, fortunately for Nordhaus, scientific literature tends to be forgotten in a few years. I also tell this story in the chapter that I can send to you. Ugo, I would like to get a copy of this book. Charles Hall brought it up in a separate conversation yesterday. Where is the best place to order it? 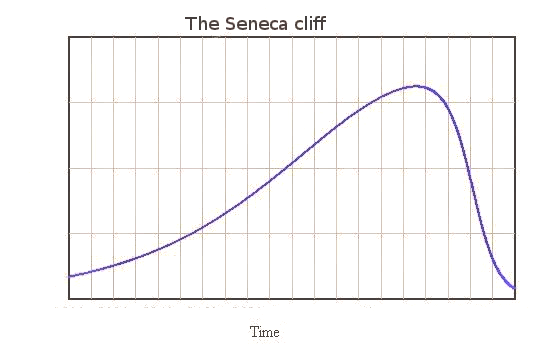 I've just placed an order for your book, having followed the link from your article The Seneca effect: why decline is faster than growth. ISTR you tried to bring your book to my attention when it was first published; sorry I didn't pay more attention back then. I hope that sales are buoyant (mainly since if they're not, it doesn't bode well for the distribution of the meme). I just discovered LTG Revisited after seeing the Wall Street Journal editorial (Saturday, April 25, 2014) titled "The World's Resources Aren't Running Out." I'll be ordering Revisited after writing this comment. My professor made LTG required reading for my second year course in chemical engineering in 1972. It's message has stuck with me. I even printed out the 2000 paper by Simmons for my two teenage sons, and obtained a copy of the original LTG for them to read, with instructions to understand how exponential growth is modeled. A few years later Al Gore published his "slide show" and my elderly father - also a chemical engineer - wrote letters to his children (i.e., me!) explaining why climate change is a farce. These are interesting times! So the point that critics ignore is that LTG was one of the first attempts to model the world with a computerized dynamic simulation. It very clearly states that the model is directional, not predictive. It very clearly states that assumptions, such as the amount of fossil fuel reserves, are just that - assumptions. But it also plainly shows that the growth streams are interactive, and that removing one obstacle (oil, for example) doesn't alter the overall premise that there are, wait for it... LIMITS to growth! I'm pretty sure I could replicate the LTG simulation on my laptop using Excel. But I'm equally sure that the model's simplicity doesn't detract from its purpose, which was to spur policy makers to action. It's unfortunate for all of us that it failed, in 1972, to garner even the very tepid response that recent UN reports have evoked. I felt pessimistic about the long range prognosis for the planet back then, today I'm completely fatalistic. Yes, I read LTG when I was in college. 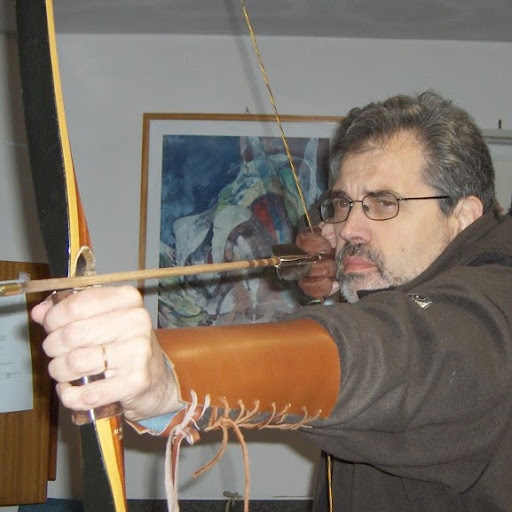 To paraphrase St. Paul: "When you become a man you abandon childish things." There are obvious limits to growth but it seems the predictions were premature. I don't know what the ultimate limits are but it would be good to see real scientific data on that. In general, mankind has a good track record of adaptation to scarcity. "Author talks of climate science, but doesn't mention chemtrails??? " sigh, more nonsense from mentally ill people, who do not understand basic science. these are human made CLOUDS of water vapor from burning HYDROcarbons in a supersaturated, cold atmosphere.